Roti is a symbol of the Caribbean’s brillaint yet complex cultural history. Originally brought to the Islands in the 1830’s by indentured Indian labourers, roti quickly became one of the most culturally significant foods in the Caribbean. Guyana and Trinidad who have the biggest Indo-Caribbean communities are today the bastians, though roti is eaten all over the Caribbean and diaspora, with each island having their own versions. Caribbean roti, a simple yet complex flatbread to be served with curries or stews. Like that made by our ancestors, our roti is a continuation of Caribbean culinary culture, this time in London. 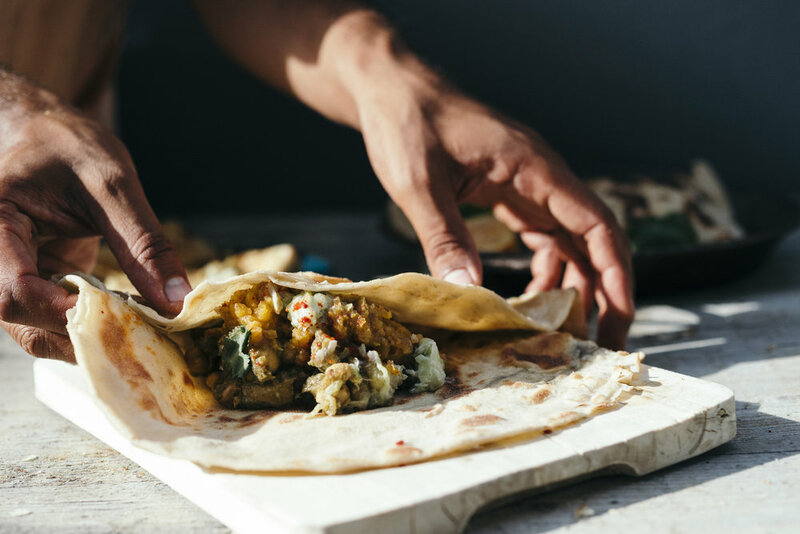 The roti skins that we lovingly make in-house draw inspiration from our families, our Caribbean friends and from living and growing up in multicultural London - drawing inspiration from diasporas also present in London. Our roti curries and stews are representations of our pan-Caribbean attitude. We draw inspiration from #allislands while ensuring we respect the traditions that have been handed to us. Every element of Caribbean cuisine can tell a story of our past, and our future. The question of ‘how to eat roti’ can spark days of contention. Wrapped, Buss-Up-Shut or as it comes - we like to experiment with them all. Roti’s deeply personal connection to the Caribbean’s multicultural and diverse history, particularly in Trinidad, Tobago and Guyana, makes it a mainstay of the culture.